Innovative strategies to conserve the world's coral reefs are included in a new guide released today by NOAA, and the Australian Great Barrier Reef Marine Park Authority, with author contributions from a variety of international partners from government agencies, non-governmental organizations, and academic institutions. 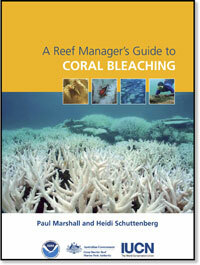 Referred to as A Reef Manager's Guide to Coral Bleaching, the guide will provide coral reef managers with the latest scientific information on the causes of coral bleaching and new management strategies for responding to this significant threat to coral reef ecosystems. The guide, A Reef Manager’s Guide to Coral Bleaching, is the result of a collaborative effort by over 50 scientists and managers to: (1) share the best available scientific information on climate-related coral bleaching; and (2) compile a tool kit of currently available strategies for adaptive management of coral reefs in a changing climate. The result is a compendium of current information, tools, and practical suggestions to aid managers in their efforts to protect reefs in a way that maximizes reef resilience in the face of continuing climate change. The Guide is a joint publication of the National Oceanic and Atmospheric Administration and the Great Barrier Reef Marine Park Authority, with author contributions from a variety of international partners from government agencies, non-governmental organizations, and academic institutions. Dr. Jordan West of EPA’s Office of Research and Development was a major contributor to the Guide as a chapter author and through participation in the final review and editing process for the entire document. Oct 2006 Manager’s Guide released.